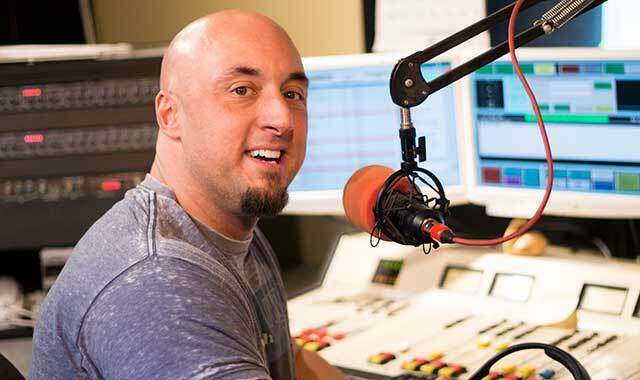 Media Profile: He looks like a wrestler and a tough guy, but inside this hulking radio personality is an easygoing guy who’s passionate about discovering musical talent and healthy eating. Jon Schulz, a host and music director at 104.9 WXRX, enjoys discovering new recording artists. He’s also been known to pull pranks on co-workers. Looking at Jon Schulz, one might confuse him with a body builder, or maybe a wrestler. Turns out, he’s been both. But those are just his hobbies. You might know him better as Captain Jack, afternoon host and music director for 104.9 WXRX in Rockford, part of Midwest Family Broadcasting Co.
Schulz is a hulking figure. At 6 feet, 3 inches tall, and 245 pounds, he’s imposing and muscular, with a clean-shaven head. He even possesses a large tattoo that swallows most of his massive right bicep and depicts a radio microphone head, as well as a bright red cardinal, in tribute to his late grandmother. He resembles Mr. Clean more than, say, Howard Stern or any other radio personality. “Most people think men in radio are heavy guys who wear Hawaiian shirts,” he says, laughing. Schulz, who grew up listening to rock bands like KISS, started his radio career playing adult contemporary music at a small station in his hometown of Freeport. After graduating from Freeport High School, where he played football for the Pretzels, Schulz attended Highland Community College, where he hit a roadblock and was undecided about a future career. “I had no idea what I wanted to do,” he says. A high school friend who worked part-time at the Freeport radio station encouraged Schulz to apply. “I had no idea what to expect,” he says. Turns out, he enjoyed the radio business enough to pursue it full-time. While he enjoys playing the hits, Schulz also finds himself immersed in the business side of the radio industry, a major responsibility of the music director at WXRX. Away from the radio station, Schulz commits equal resolve and passion to his other interests. For 10 years, he was involved with independent professional wrestling. The first match he ever took part in was at Rockford’s BMO Harris Bank Center, where the promoters of the show were looking for a local radio personality to wrestle one of the show’s biggest stars. Schulz was selected from the crowd of 7,000 to get into the ring with wrestler Jimmy Hart. “I was absolutely terrified,” says Schulz. For the next decade, he wrestled in school gyms, armories and bingo halls with some success, before hanging up his tights for good. From pro wrestling, Schulz entered the world of competitive bodybuilding, thanks to some encouragement from buddies at the gym where he trains. For the past three years, Schulz has participated in various bodybuilding competitive events held in Madison, Wis. Last fall, he reached his goal of finishing in the top five. Strutting across a stage in front of judges and fans wearing nothing but a posing suit intimidates some people, but not Schulz, who preened before large crowds as a wrestler. Schulz is a creature of habit. He trains every morning before heading into the radio station. Work and training tend to balance each other out. Schulz has branched out. Last year, he started working as a contributor to radiocontraband.com. He interviews various musical artists for the company’s website in a segment called “It Goes to 11,” in which he asks every band the same 11 questions. Schulz is having fun, and it shows. His love for music – and life in general – rubs off on his family, wife Sherri and sons Nicholas, 14, and Gavin, 11. They enjoy tagging along with Schulz to concerts and rock festivals, which is fine by him. This entry was posted on Monday, June 9th, 2014 at 11:51 am	and is filed under Features, Top Posts. You can follow any responses to this entry through the RSS 2.0 feed. Both comments and pings are currently closed.